Spread goodwill and hope as Glinda or Cinderella! The clear plastic footwear has a butterfly image sewn into the shoe and a 2" translucent heel. The shoes also have a white faux leather interior. In addition, a solid black sole helps prevent slipping. 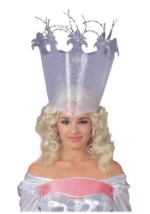 Check out our Glinda wands and princess tiaras!